OUR AIM: At Sarc we aim to provide an exceptional quality of hairdressing at realistic prices by friendly and west end trained hair stylists. 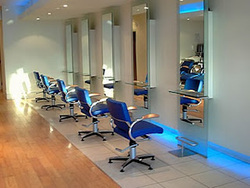 We are a wella based salon with a modern, relaxing and comfortable environment. We are committed to using only the best professional products and to constantly achieving the highest standards in all aspects of hairdressing. Fatma, the owner of Sarc always wanted to provide an exclusive west end salon experience without the extortionate cost that some salons charge. SERVICES: We provide a wide range of services from cutting to highliting, colouring, straightening, perming, bridal hair, sunbeds, nails, pedicure, manicure. Some Sundays available please contact us for more information.